Global Nutritional Lipids Market size was worth more than USD 6 billion in 2016 and will witness CAGR over 10% up to 2024. Nutritional lipids market growth is attributed to the increasing obese population, rising incidences of cardiovascular diseases (CVDs) and growing health consciousness among consumers. Factors such as aging population, changing food habits, along with increasing applications in infant formulas and dietary supplements, thereby, driving the product penetration. Technological advancements towards microencapsulation in emerging economies, owing to its various benefits in applications including pharmaceuticals, functional foods, animal nutrition, among others is also expected to support the lipid nutrition market size. As the technology protects vital nutrients in food by enclosing it in a shell. Also, it offers smooth processing and packaging due to its ability to change liquid form ingredient into powder. Rising demand for fortified food additives from infant formulas and dietary supplements due to wide range of health benefits will drive the industry demand. The global food additives industry will generate more than USD 55 billion by 2024. The nutritional lipids market will witness a substantial expansion due to growing demand for food & beverages with high nutritional content coupled with consumer preferences based on the factors such as taste, flavour and colour. Balanced diet plays a vital role in getting rid from chronic diseases. High fat, especially unsaturated and trans fats lead to obesity, in?ammatory arthritis, heart disease, degenerative and osteoporosis, and cancer. More than 75% of cancers cases in the U.S., are attributed to unhealthy diet. According to USDA, around half of the population develops a diet related chronic disease, leading to death like stroke, diabetes, heart disease and arteriosclerosis, henceforth increasing the annual health costs over USD 250 billion in the U.S.
Lipid nutrition consumption has shown significant health benefits in the development of eye, brain and support cardiovascular health benefit throughout life. As per analysis, lipids including EPA, DHA and ARA are vital nutrients for health, still population do not include adequate in their daily diets. The lipid nutrition industry is at the initial stage of development, with significant growth opportunities. Nutritional lipids market price trend is mainly influenced by increasing raw material costs including fish oil and flaxseed oil. Declining fish oil production due to fishery sustainability issues may hamper the supply and demand scenario. Stringent regulations enacted by FDA particularly on Antarctic krill & fish oil along with easy availability of alternative products are major factors restraining industry growth. Omega-3 market was valued over USD 4 billion in 2016. 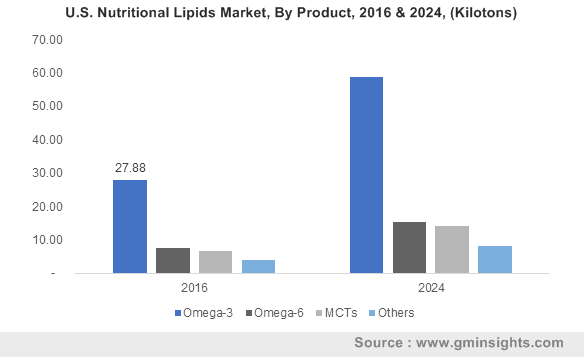 Increasing consumer awareness regarding preventive medical products and health benefits of omega-3 are among key factors driving the lipid nutrition demand. Enhancing eye and brain health along with prevention from depression and heart diseases are key properties enhancing product scope in pharmaceutical and food fortification applications. Medium Chain Triglycerides will witness growth over 9% up to 2024. Increasing consumer preference towards MCTs over regular fats in diet will provide positive outlook for product demand. Rising preference for natural and bio-based ingredients coupled with growing health concerns among consumers will propel lipid nutrition market growth. Moreover, easy and abundant availability of palm kernel and coconut will support business growth. Nutritional lipids market is led by dietary supplements applications accounting for more than 55% of the industry share in 2016. Shifting trend towards healthy lifestyles to avoid the healthcare expenses is among major factor fuelling the industry growth. In addition, rising pollution levels has enhanced necessity for supplements to extend healthy life spans. Advancements in encapsulation technologies along with emergence of soft gels are the major supporting factors of the product demand. Animal nutrition application will witness gains exceeding 9% up to 2024. Key health benefits for pets including enhanced immunity system, decreased inflammation along with healthy skin will support the product penetration. Moreover, effective curing of osteoarthritis particularly in cats and dogs will support the industry growth. Liquid nutritional lipids market was valued over USD 4.5 billion in 2016. Rising adoption of soft gels for supplement dosage due to ease in consumption is among key factor driving the industry growth. Effective functionality and high absorption rate further opens new opportunities for product demand. Powder lipid nutrition market will witness growth over 10.5% in terms of revenue. Superior shelf life, convenience in production & handling along with cost-effective properties are key factors driving the industry demand. Lipid nutrition demand from animal source was over 100 kilotons in 2016. Rising demand for omega-3 and other fish oil-based products due to high EPA and DHA content has enhanced the industry demand. As per analysis, omega-3 content in fish oil accounts for 100%, whereas plant sources account for less than 10%. Moreover, comparatively improved absorption rate in humans along with non-GMO properties provide a positive outlook for industry growth. Plant source is estimated to witness CAGR over 9.5% up to 2024. Growing vegan population globally due to increasing health consciousness among consumers has positively influenced the product demand. Rich omega-6 and MCTs content particularly in safflower, sunflower, corn and coconut oil will propel the industry growth. Asia-Pacific nutritional lipids market demand accounted for more than 30% of the industry share in 2016. Growth in pharmaceutical and dietary supplement industry particularly in China and India are among key factors driving the industry demand. Increasing nutrition concerns among infant and women has further enhanced the regional demand. Favourable socio-economic factors along with foreign direct investments liberalization will support the business growth. North America nutritional lipids market will value more than USD 4.5 billion by 2024. Increasing prevalence of obesity & diabetes resulting in necessity for nutritious diet will propel the product demand. Expansion in functional food & beverages industry accompanied by favourable regulations for dietary supplements will drive the regional demand. 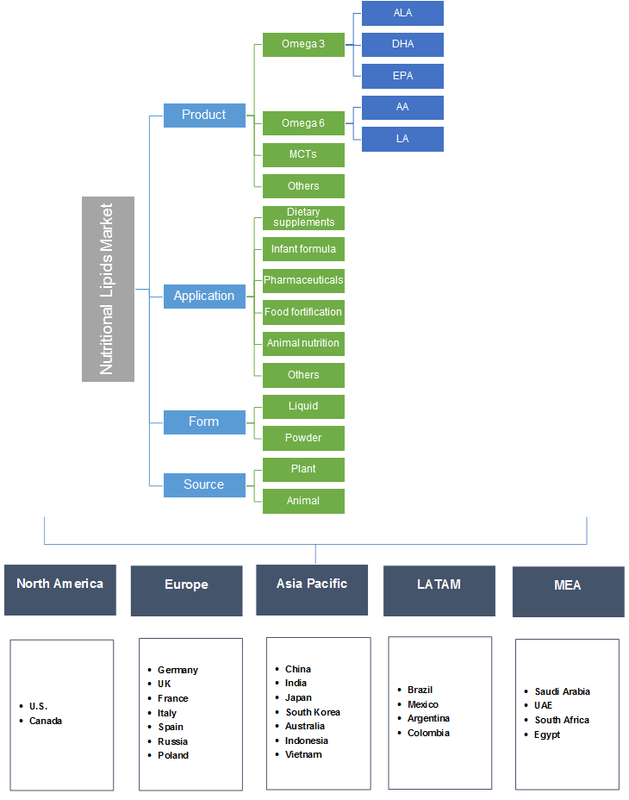 Global nutritional lipids market share is highly fragmented due to presence of large number of regional players operating in local markets. Increasing new entrant penetration particularly in Asian countries further makes the industry competitive in nature. DSM N.V., Croda International, Archer Daniels Midland Company, BASF and Polaris are major industry players. Nutritional lipids are widely used as highly stable emulsions to enhance nutrient content mainly in dietary supplements, pharmaceutical and food fortification applications. Krill & fish oil along with flaxseed, safflower and sunflower oil are the major raw materials. Fats are mainly classified as saturated, monounsaturated and polyunsaturated fatty acids. Omega-3, Omega-6, MCTs and Omega-7 are widely adopted products for dietary supplements. Increasing consumer awareness pertaining to disease prevention due to increasing health concerns will support the industry growth.